One of the true delights of being a parent to a young child is reading picture books. It’s fun to read favorites from my own childhood like Cloudy with a Chance of Meatballs, Caps for Sale, and pretty much anything by Dr. Seuss. But it’s even more fun to discover new authors and illustrators. Yesterday I was reading a picture book to my small son. 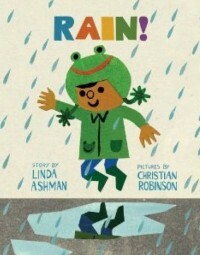 The book was the adorable and beautifully-illustrated RAIN! by Linda Ashman, which came out earlier this year. I love the book because it’s all about perspective. A grumpy old man sees that it’s raining one morning and complains that he has to put on his “blasted overcoat” and trudge out into the gray day. I can identify with his curmudgeonly character. I feel the same way on lot of mornings lately, as winter settles in over Wisconsin. Meanwhile, the books follows a young child in the same city neighborhood. The child jumps up and down with glee when he learns it is raining. For the child, the “bad” weather is an opportunity to don his frog hat and galoshes and go puddle jumping. Same day, same neighborhood, same weather, different experiences. It’s all about perspective. I’ve read this book many times to my son, but yesterday, I gained yet another level of insight. For the last couple of months, I’ve been in deadline mode, finishing my second book while gearing up to promote my first, VINTAGE, which comes out in March. Add a day job and a house renovation to that and you can see how there hasn’t been much room lately for goofing around. So, yes, my son’s analogy was accurate. But just to prove him–or more likely myself–wrong, we headed to the park after finishing the story. We basked in what will probably be one of the last sunny, mittenless autumn days. We dropped spinning maple helicopters from the top of the jungle gym. We walked around the block, identifying the makes, models, and colors of cars (yes, my toddler is a bit auto-obsessed). I knew that later, I’d have to go back to my laptop. But a kids’ book reminded me to make time for play, too. Great idea. I’ve been posting pretty infrequently here, since the Debutante Ball posts have sort of taken over (in addition to everything else)! But now and then I still like to come over here and add a little something to my “home” on the internet. Thanks for visiting me today, Susan. I keep forgetting to check out what’s going on in your blog world (and Heather’s…and Natalia’s…and Lori’s…). 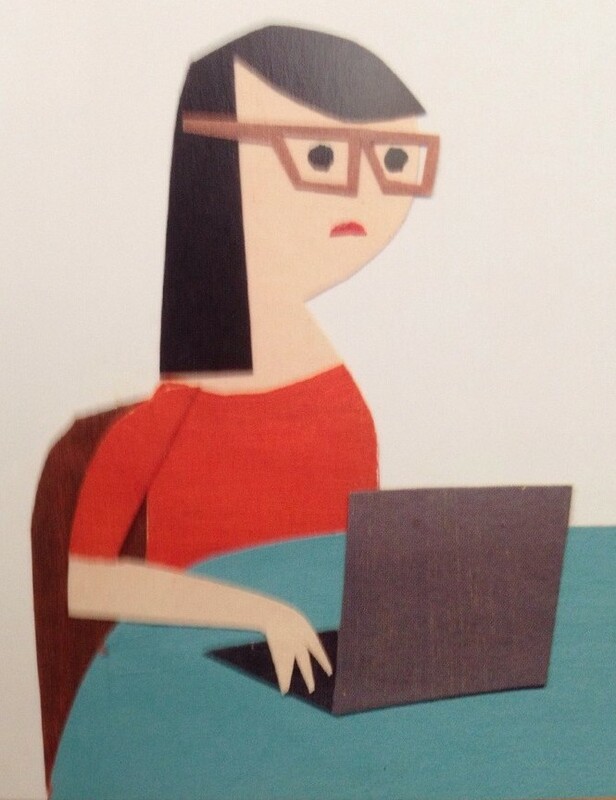 I thought that was you in the illustration, too! Have to get this book, sounds like one for every age. Priceless. I’m so proud of/admiring of you, Susan. Omg, I love this! What a wonderful book—I’ll have to buy that one for my niece. I love that your son saw you in it and that you both made time for play.